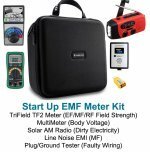 A very interesting one hour EMF video introducing EMF Detection, Protection, Presentation and Remediation training, and life in demand as a Certified EMF Expert Consultant. 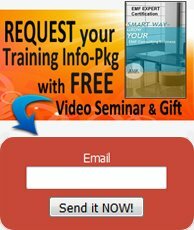 Please give the video component of this presentation a few minutes to load, as this is a large streaming file and the audio tends to begin playing before the video is completely loaded..
Click on the "full screen" icon in the lower right if you'd like to view the presentation more easily on a larger screen. Sit back for a relaxing hour to learn everything you ever wanted to know about the growing EMF phenomenon of wireless electrosmog (cellphones, WiFi and more), what it takes to become a certified EMF Expert consultant, what a day in the life is like, the income potential, the demand and the many doors an EMF Consultant Certification can open in the various related areas of specialty. All this presented in a professional powerpoint video on our university-style online training platform with senior electrical engineer, Chris Young, explaining in everyday English the burgeoning new field of EMF personal protection, its methods, products and most of all its importance.